Kat and Karl : matt and meredith dill! 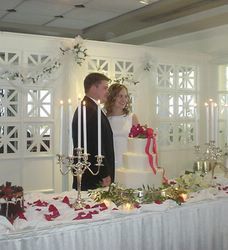 the beautiful bride and groom getting ready to cut their cake at the petrolium club in tulsa, ok! the food was great, the toast made me cry; all in all, it was a PERFECT matt and meredith wedding! so pretty! where was the recep??? Hooray! Congratulations, Matt & Meredith! Looks like it was a good time. okay NOW She posts where the recep was and makes me look dumb! it wasnt on there when i asked! congrats m&m!! !